Boats that sail further and longer ! Associates since 1974, Joubert & Nivelt are very complimentary in the way they practice their profession of naval architect: Michel Joubert takes care of the motor yacht design, while most of the sailing yachts are designed by Bernard Nivelt. Both well-known as seasoned sailors, the two men from design boats to match the oceans they explore: designed to sail a long time and capable of facing up to the toughest conditions. More than 25,000 boats have been launched designed to their plans. Swift Trawler line, he was 73 years old when he died. Michel Joubert : Our design office is eclectic and imagines boats as diverse as the Teasing machine, the IRC racing yacht that won the last Sydney Hobart race, Elisabet, a 47 m motor yacht, and Fleur Australe, an expedition sailing yacht with Philippe Poupon and Géraldine Danon, with which to rediscover wonderful places in the world. We also designed Stars and Stripes, the catamaran on which Dennis Conner won the America’s Cup in 1988, as well as a great many one-off examples or production sailing and motor-propelled monohulls, catamarans, and trimarans. They all have our trademark and I believe this is what makes them stand out: our designs must sail long distances for a long time, in the harshest conditions. Michel Joubert and Bernard Nivelt, the designers of Beneteau’s Swift Trawler, started out by racing against François Chalain for many years. Competitors at sea, there was a chemistry between them onshore that was fed by their common passion for naval architecture. When in 2002, Beneteau decided to launch the Trawler programme, the challenge was to reinvent the concept: to create a new range that would make the best of all the seafaring qualities of the traditional Trawler, while integrating new speed performance and comfort. François Chalain naturally turned to Michel Joubert, who showed him Marguerite, his expedition motorsailer, saying “we need something fantastic like that!” The Swift Trawler 42 was Michel Joubert’s answer. 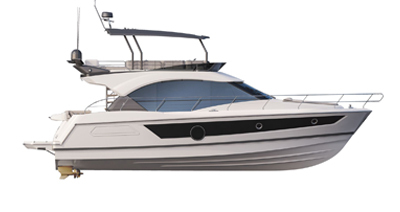 He then made several versions of the concept, enriching it with new solutions on the Swift Trawler 52, 34, 44 and 50. Michel Joubert : François Chalain was taken in by the Trawler aspect of the Marguerite, a 16 m expedition motorsailer, with which I have been exploring the beauty of the great North in harsh sailing conditions for well on 15 years: Scotland, Norway, Pittsburgh, Iceland, the Faroe Islands, the coast of Greenland, Newfoundland, Labrador, the Northwest Passage, Alaska and British Columbia. He felt that Beneteau could offer its customers a similar type of motorboat, capable of sailing long distances in maximum safety and often in very harsh sailing conditions. However, this trawler also had to be capable of a speed of over 20 knots. The wonderful success of this range now speaks for itself!